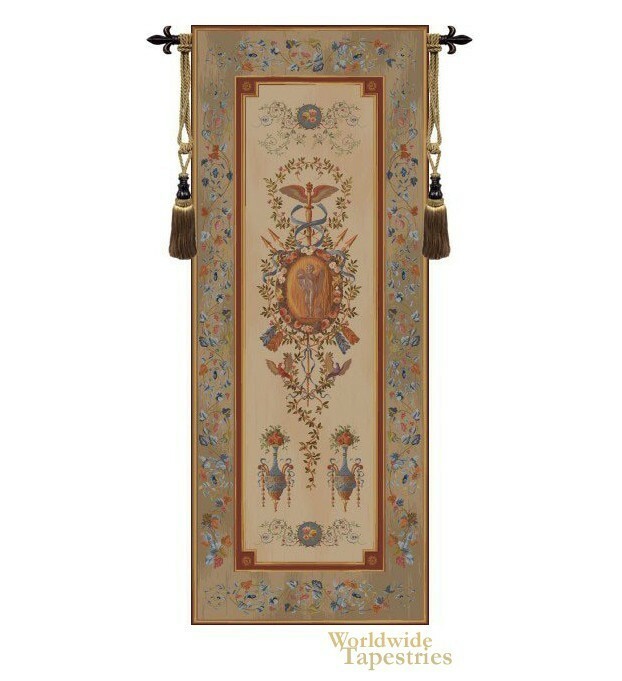 This Portiere Cupidon tapestry shows a classic French portiere. The portiere style of tall tapestries were used in palace walls and chambers to provide decor in French 18th century. Here we see cupid in the central cameo, with an ornate decoration all around, of birds, flowers, arrows, and vases. The color palette is warm and cosy and the burnt oranges, blues, crimsons and beiges goes together beautifully. This Portiere Cupidon tapestry is backed with lining and tunnel for easy hanging. Note: tapestry rod and tassels, where pictured, are purchased separately.